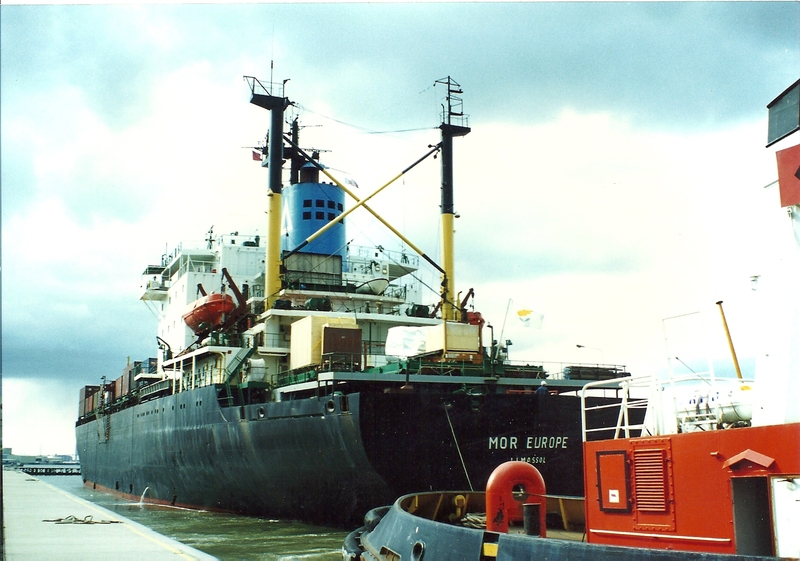 The MOR EUROPE in the locks. She was built in 1978 as the KHUDOZHNIK ROMAS to 1994. Owned by the Government of the Republic of Russia and managed by Delphic Shipping. This containership started life in 1978 at a shipyard in Warnow, in the then German Democratic Republic as the USSR-owned KHUDOZHNIK ROMAS. 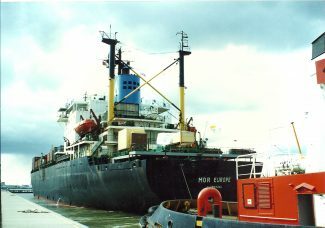 KHUDOZHNIK ROMAS (15,306 tons gross) was sold in 1994 to Hondel Shipping Co Ltd, of Cyprus, a subsidiary of Uniship (Hellas) Shipping & Trading, of Athens, Greece, and was operated by another subsidiary Delphic Shipping Co Ltd (Delta on funnel). It retained its “Russian” connection on charter to Morline, for which it was renamed MOR EUROPE. When the charter finished in March 2000, it was renamed DORSET under the flag of Panama. Two years later the vessel was broken up in China. See also Jack’s photo of MOR CANADA.